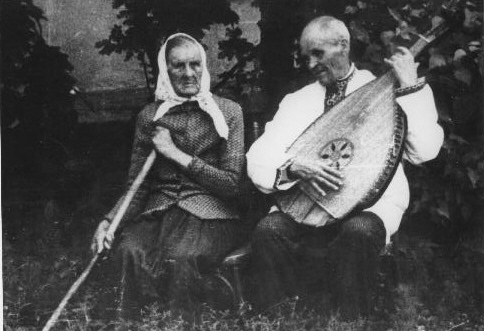 The blind kobzar Ehor Movchan with his sister back in his home village Vekykyi Pysarets, Sumy region; photo taken in 1968. During the Soviet period, traditional performers were encouraged to develop a Soviet repertory and one of the tasks of folklorists was to help them do so. Movchan responded to Soviet pressure and composed several songs on new topics, the most famous of which is Duma pro Lenina, once an obligatory part of any kobzar performance. According to Pavlo Suprun, Movchan felt that God punished him for complicity with the Soviet agenda. In his old age, Movchan suffered from a swelling of the fingers which made him unable to play his beloved bandura. Movchan told Suprun that he interpreted this condition as retribution.